For those of you who are new to my blog I am not a professional music critic. Simply love music so much that I want to write my thoughts and opinions about albums, songs, and performances. So that’s exactly what I’m going to be doing today I will talk to you guys about the Lindsey Stirling performance I saw this Tuesday. Lindsey Stirling is one of the most innovative and creative violinist of our time. This may sound like an exaggeration, but go on over to her YouTube channel and you will be blown away by her talent. Lindsey Stirling, Brave Enough, album cover. Before I get into the good stuff, I want to give you guys a brief background information about Lindsey. Lindsey Stirling was born on September 21, 1986 she is an electronic classical performance artist. She combines both genres of music and dances while playing the violin, as you can imagine it takes a lot of stamina to be able to do that but she makes it look so effortless. Lindsey decided in 2010 to appear on America’s Got Talent, but she got voted off further into the show and was told she wouldn’t be able to sell out any shows with this kind of music. She then took her music YouTube, cinematographer David Gray reached out to Lindsey in hopes of collaborating on a YouTube video together. From there her music started to take off and slowly she gain more following. She has released three albums and her first release was her self-titled album Lindsey Stirling. She has performed with many amazing singers such as Celine Dion, and she won a Billboard Award for Top Dance Electronic album. Do I need to say more, she is quite amazing! 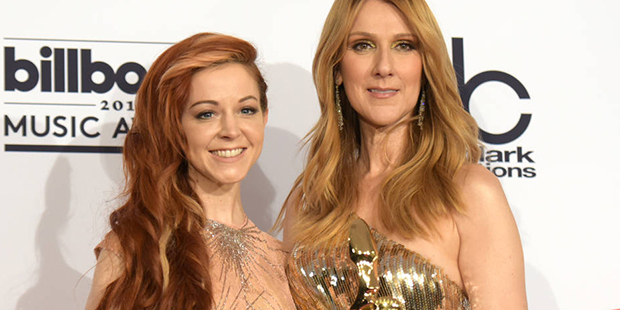 Lindsey Stirling, along side Celine Dion at the 2016 Billboard Awards! I’m going to give you a breakdown of what the concert was like and what to expect if you are attending her. The concert began with Shawn Hook as the opening act, who is also a fellow Canadian. He has performed with Elton John, so he is someone to look out for in the future. If I can recall correctly, he performed about 4-5 songs, including his famous single, “Sound of Your Heart”. He had great vocals, very clear and not auto-tuned at all and his piano skills were on point. The show began at 8:00pm, Shawn performed until 8:30pm and then we had a half an hour intermission. At 9 o’clock, the star of the night appeared on stage, she performed her song “Pheonix” and it was an electrifying introduction. The stage looked incredible, three screens were set up and on top the Brave Enough logo could be seen. The costumes and stage effects were quite impressive, in front of the main stage there was a net-like looking screen that was brought down. On that screen special effects were projected, such as leaves falling down or the effects of rain. It was definitely a very unique visual experience. Seeing Lindsey perform on stage you can see she definitely has the charisma and the energy to keep the audience engaged. She loves what she does for a living and this is her passion. The skill of dancing and playing the violin at the same time can be a very hard but she manages to pull it off very well. Lindsey Stirling is a very down to earth person who engaged with the audience and had conversations with them. She put together a little skit that supposedly was filmed backstage, it was quite funny and we were all laughing. Lindsey along with her drummer and guitar player, came out onstage with child sized music instruments and played a song or two. That just goes to show even with a child’s toy she can still pull it off. After the skit Lindsey took the time to talk about one of her crew members, Gavi, who passed away of cancer. She talked about how hard it was for her to deal with this loss and how she’s overcoming it. She performed a tribute song for Gavi with a special video montage she put together of him. After this tribute performance, Lindsey talked about a song that Gavi and her started writing together before he passed away. They couldn’t finish it so she said that she worked very hard and she felt that she had Gavi’s support from up above to finish the song. It was very touching performance. Afterwards, Lindsay changed costumes and played a few more songs before ending the show. When she performed her song, “Arena”, she talked about the adversity she faced when she was told that she will not be able to make it as a musician. Her positive message to anyone in the audience who had any special talents was never to give up and never to let anyone tell them that they cannot do it. Instead she said to use it as a way to get back up there and fight for what you are born to do. It was such a great message and it really hits close to home for me personally, because I have lots of aspirations and dreams for the entertainment industry. After she left the stage everybody were yelling encore, encore, we all wanted to see her back on stage and she came back for one final performance of “Roundtable Rival”. What am I going take away from this concert experience? I have learned that being persistent to chase your dreams is vital. Never give up, Lindsey didn’t and now she is a star. Make sure you visit her YouTube channel, you are in for a treat! Posted on October 22, 2016 October 23, 2016 by dailytalkPosted in Music, UncategorizedTagged blogger, brave enough tour, canada, classical, electronic music, lindsey stirling, lindsey stirling brave enough tour, music, music blogger, toronto, toronto blogger, violin, violinist, wordpress, wordpress blog. Previous Previous post: The Ugly Side of the Kpop Industry! Next Next post: Life Through a Lens!